Lieutenant E.H. Harper was the eldest son of Mr. Henry M. Harper, Northland Place, Dungannon, whose youngest son, Lieutenant Ernest M. Harper, Royal Munster Fusiliers, was killed at the Dardanelles on 9th August last. 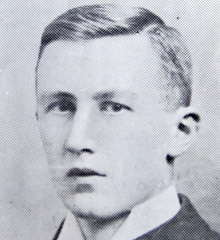 Lieutenant E.H. Harper was educated at Dungannon Royal School, Queen’s University, Belfast, and Trinity College, Dublin. He held an appointment as Lecturer in Bangor University, Wales, and prior to the war was Professor in Mathematics in Cork University, which position he relinquished to volunteer in the service of his country. He obtained a commission in the Royal Munster Fusiliers in May, 1915, and was transferred to the South Staffordshire Regiment, where he received promotion. He was an enthusiastic Rugby football player. 2 2nd Presbyterian Dungannon Edgar H Harper, killed in action. 3 Book "Aerial locomotion" Book co-written by Edgar Henry Harper. First published in 1910.